Here is my library of watercolour books and art books in my collection. Here is a complete list of watercolour books and art books that I’ve collected over the many years I’ve been interested in art and watercolour painting. Feel free to use the tools provided on this page to sort through this list and to aid your searches. 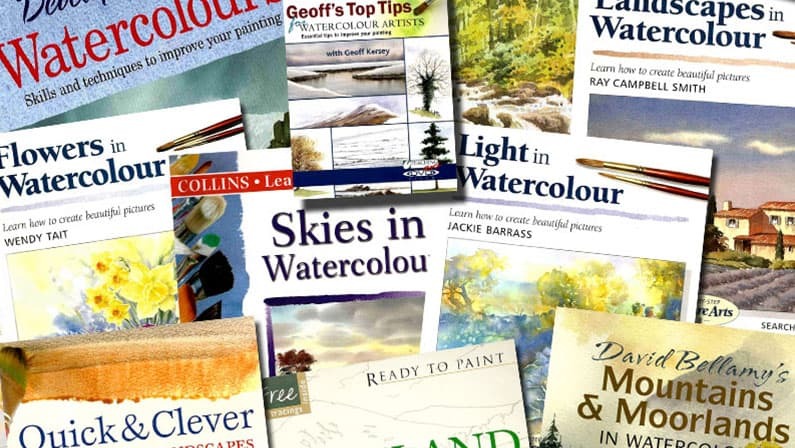 Some of these titles will help you produce fine art watercolour paintings, and many of them contain easy-to-follow lessons which will suit anyone who is beginning to paint in watercolour, to the more experienced/advanced watercolourist. You’ll find links within my blog posts of the various projects and watercolour exercises that I’ve completed, and links to my watercolour book and DVD reviews where I’ve had chance to write them. Should you wish to buy any of these DVD’s or books from my shop or on Amazon I’ve provided the links for this as well. Where possible I will also try to include links to free watercolour books, DVD’s, downloadable watercolour books, videos and tutorials, and even to sales of second-hand, used watercolour books, DVD’s and videos when I find them. You can change the number of books displayed on the page, and re-order or sort the columns by clicking the titles in the blue column at the top. You can also search my entire database by entering text into the search box located at the top right corner of the table below. If you buy any of the watercolour books using the links provided here I may be entitled to earn a small commission (which helps me pay towards the cost of running my website) but this won’t affect the price you pay. Please read my full e-commerce Disclosure if you want to find out more.